With so few tunnels in our small state, I can certainly gain first-hand evidence of each and every one. And this one, located in the 184-acre Gillette Castle State Park, may be my favorite. Gillette Castle is visited by thousands of tourists every year, and yet, I’d reckon that maybe 1% of those visitors make it out to the northeastern reaches of the park to walk through this tunnel. 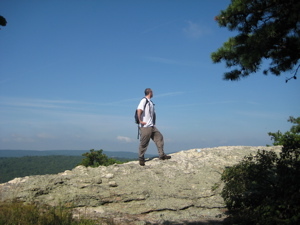 I took my two sons up there on a beautiful Sunday afternoon in August and the castle and picnic area parking lots were full. And yet, we had the trail to and from the tunnel to ourselves. Such is the human condition these days I suppose. 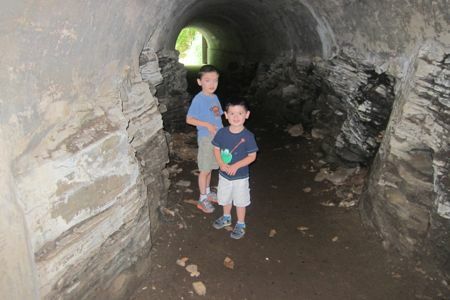 The tunnel is part of the 3-mile narrow-gauge train layout William Gillette built for no other reason than it was a cool thing to do. And to my mind, his old railroad was as cool as his house. And his house, Gillette’s Castle, is really, really cool. I really wasn’t expecting too much from the tunnel as we made our way to it, but once I saw the dark entrance ahead, I got a little excited. 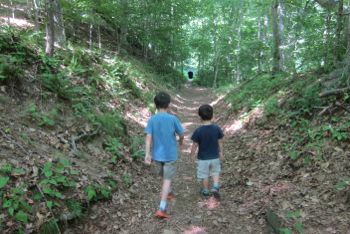 This is a real tunnel with a slight curve in the middle – and one must walk through pitch black to get to the other side. I imagine this was a highlight of the Gillette-led train rides around his property. The tunnel is 75-feet long (!) and I’m sure someone with a nice camera and the skills to use it could take some great pictures here. There really aren’t too many online because like I said, it seems as though very few people make the (simple) effort to get out here. 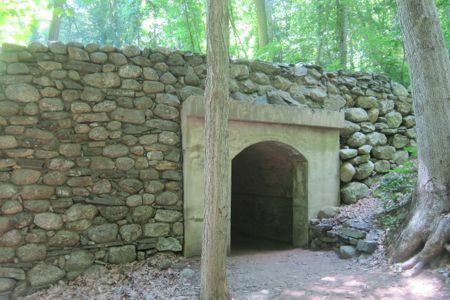 So there you have it – one of Connecticut’s rare true tunnels. I put the call out on my Facebook page and learned of a bunch of tunnels in the state, but this one is certainly unique and arguably the coolest one.